Horse lovers are sure to appreciate these festive cards! Each card features a lovely white horse with a silvery mane. The horse wears a plaid scarf adorned with a spring of holly and jingle bells! 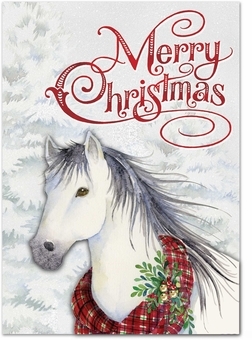 "Merry Christmas" is written above the equine, and gems and glitter make the card truly sparkle! Inside is the message "Warmest Holiday Wishes".